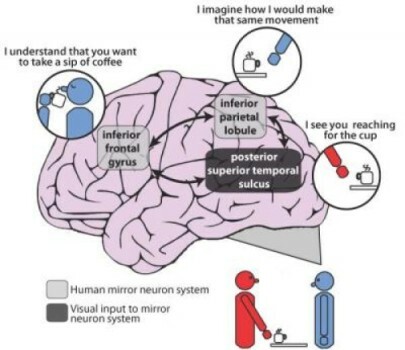 This is an illustration of the mirror neuron system in the human brain which has been implicated in the impaired ability to imitate experienced by many patients with schizophrenia. A brain-mapping study of patients with schizophrenia has found that areas associated with the ability to imitate are impaired, providing new support for the theory that deficits in this basic cognitive skill may underlie the profound difficulty with social interactions that characterize the disorder. In a paper published online on Mar. 14 by the American Journal of Psychiatry, the researchers report that when patients with schizophrenia were asked to imitate simple hand movements, their brains exhibited abnormal brain activity in areas associated with the ability to imitate. The new study is the first to use functional magnetic resonance imaging, which maps levels of brain activity by measuring associated changes in blood flow, to examine the brain activity of schizophrenia patients while performing basic imitation tasks. It was performed on 16 medicated schizophrenia patients and 16 healthy participants. While lying in the scanner, participants watched a computer display that showed either a video of a hand pressing buttons on a button box or an animation of an ‘X’ that moved to different fingers on a still image of a hand. Participants were given three different instructions: push the same button as the hand in the video; push the button under the finger marked with the ‘X;’ or simply observe the display. As a result, the experimenters could look at brain activation associated with imitation (pressing buttons while watching a video of a moving hand) and non-imitative action (pressing buttons while watching the moving ‘X’). The researchers found that the individuals with schizophrenia showed altered brain activity levels in regions of the brain that prior studies in primates have identified as crucial for imitation. During imitation, the patients had less activation than healthy individuals in brain regions involved in detecting biological movement — the special way in which living things move — and also in regions involved in transforming this visual information into a plan for movement. At the same time, patients with schizophrenia had more activation than the healthy participants in these same regions when they performed non-imitative actions. The specific areas of the brain that become over-active and under-active are associated with the “mirror neuron” system. Mirror neurons are networks of neurons that fire both when an animal acts and when it observes the same action performed by another. They have been directly observed in the brains of primates. In humans, neuroscientists have located areas using brain-mapping techniques that appear to act in a similar fashion.